From its first origins to the present, Waikiki has evolved and matured over many decades into a “home” — home of the first-ever canoe race in 1917, home to Hawaii’s royal family, home of Waikiki Beach, the most famous beach in the world, home to the state fish, the humuhumunukunukuapuaa, and now a home to both visitors and residents. History has indeed played a significant role in the myriad of pleasures Waikiki offers those who choose to make this vibrant city their temporary or permanent home. Little did Hawaii’s royal family, who enjoyed a quiet but luxurious existence on a private estate for more than 500 years before the arrival of outsiders in 1792, realize the urban transformation Waikiki was destined to undergo. Nor could they envision that Waikiki would become one of the world’s most sought-after vacation destinations where millions of tourists every year would enjoy swimming, snorkeling and surfing along a spectacular two-mile stretch of sandy beach, in waves perfect for both the novice surfer and experienced pro. Waikiki has become a thriving center of world-class hotels (converted from historical royal estates) , upscale boutiques, casual and fine dining in the Hawaiian Pacific Rim tradition, entertainment (Waikiki Aquarium, Honolulu Zoo), and stimulating nightlife. 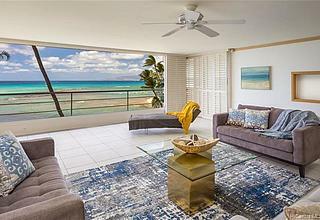 Beachfront condominiums and co-ops line beautiful Waikiki beach and the Gold Coast, delighting all with sweeping views of the ocean, Diamond Head, and Ala Wai Canal. For a change of venue, enjoy nearby Kapiolani Park, an idyllic 500-acre park perfectly suited for picnics, jogging or walking, and a popular location for various cultural events. 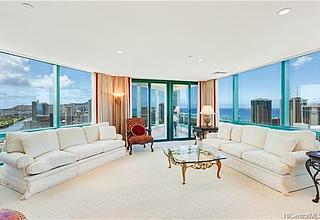 A 309-unit Waikiki luxury hotel-condominium comprised of two towers, the first of which opened in 2016 and the second scheduled to be completed in 2018. Prices range from about $750,000 to $8 million, and floor plan options are a mix of studios, two-bedroom and three-bedroom layouts as well as penthouses. Nearly 90 percent of units have already been reportedly sold since sales began in April 2013. The Ritz-Carlton Residences Waikiki Beach is home to Sushi Sho’s first restaurant location outside of Japan, a farm-to-table restaurant BLT Market, and Hawaii’s first Dean & DeLuca gourmet market. 462 unit luxury hotel-condominium completed in 2009, and which reportedly set a one day real estate sales record of $700M in 2006. 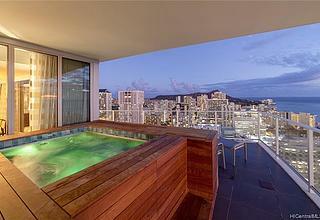 38 stories stall and located a block from the ocean in the recently redeveloped Waikiki Beach Walk area in central Waikiki. Their exclusive Trump Attaché concierge service is available to all owners and hotel guest in addition to amenities such as an infinity pool, spa services, state-of-the-art fitness center and library. Prices range from about $390,000 to $12 million. 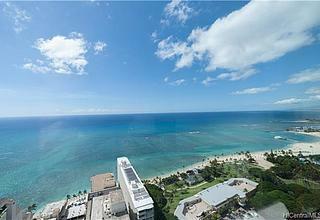 Luxury high-rise condominium building on an expansive 2.6 Acre property located at the West entrance to Waikiki. Features 196 residential units with several built out in 2003-2005, although the building itself was completed in 1993. In addition to on-site patrol guards, the building features a high-tech security system with unique keycards assigned to each resident plus 2 private elevators for penthouse owners who are able to monitor activity remotely. A 12,900+SF rooftop recreation deck with three swimming pools and two spas sits above the 567–stall parking garage. Restaurants, cafes, boutiques, and offices occupy the bottom two floors. Walking distance to shops, restaurants, and beaches. Prices range from $268,000 to $12.5 million. Also located on Waikiki’s West end, is a newer building completed in 2010. This 35-story complex with nearly 300 units sits on 2.3 Acres of land and features a 19,000+SF recreation deck with infinity-edge pool, outdoor spa, 24-hour fitness center, lushly landscaped gardens, BBQ areas and party room with kitchen. 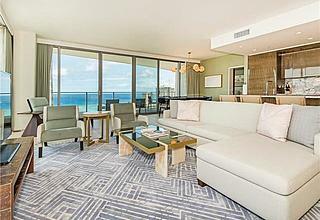 Price ranges for units currently on the market range from about $800,000 to $1.7 million.